Our household is awash with the cold virus. Nasty, nasty stuff this one is, too. A few nights ago I was kept awake by alternating waves of sweats and chills. Laying in bed I would feel hot and uncomfortable, but as soon as I would move the chills would come. I could have been laying in the Sahara and Antarctica simultaneously. What a delight. So what does one do? Well the obvious is to run for the pharmacy (which I did), but there’s also some steps you can take with what you eat to help mitigate symptoms and attack the virus. Secret weapon number 1? Garlic – and lots of it. A few garlic can be “garlicky”. A lot of garlic does not exponentially increase in garlicky taste. It somehow turns into something altogether different and wonderful. Garlic has several antiviral, antibacterial and anti-fungal properties that can be beneficial in preventing — and treating — colds. Garlic has been used medicinally for millennia in Asia. 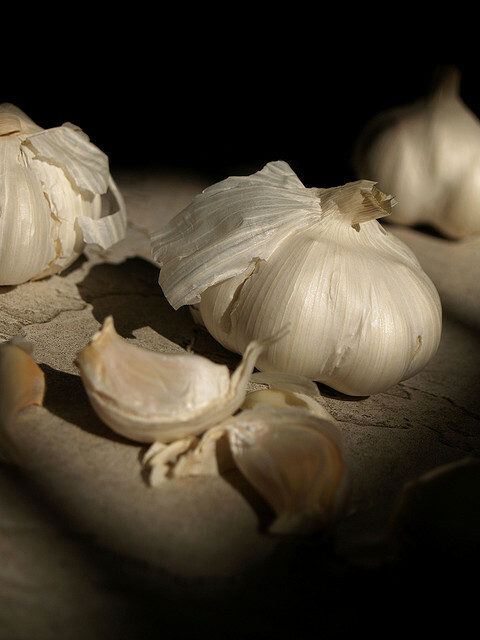 It has been scientifically proven that garlic helps boost the immune system. Raw garlic is best but it can also be beneficial cooked. Some people make a tea out of a few cloves of garlic and boiling water. Garlic tea is supposed to soothe sore throat and cough. I can’t quite imagine the taste, or maybe I can and that’s why I don’t think I would do it. Eaten raw or in a supplement, garlic is a good preventative medicine against coughs, colds and chest infections or as a natural fast-acting antibiotic if infection is already present. During the WWI raw garlic juice was used as an antiseptic for bathing wounds, saving thousands of lives. In a study cited by the New York Times, to maximize garlic’s health benefits you should crush it at room temperature and allow it to sit for 15 minutes. 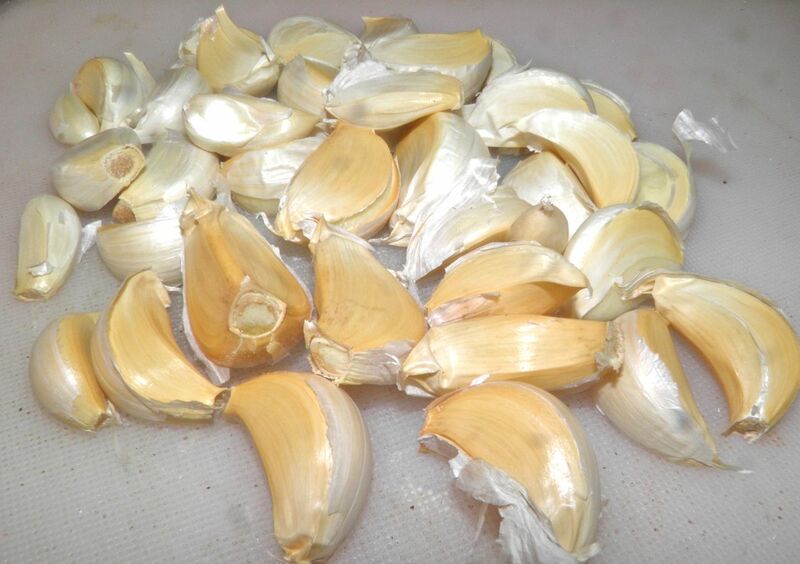 That triggers an enzyme reaction that boosts the healthy compounds in garlic. Many people take garlic supplements as part of an overall diet regimen before getting sick. This particular evening it was too late for preventative medicine. I needed a panacea. So I chose to make a Provençal soup that called for three full heads of garlic. I thought: “that ought to kill it.” Never leaving well enough alone, I opted to do a “double whammy” by combining it with Jewish penicillin (chicken soup). I guess the proof will be in the pudding (or in this case the soup). I don’t feel any worse – as if I could – and I have a wonderful “country kitchen” aroma emanating from me. A garlic aura, one might say. Comfort food has a way of getting into your very bones. That’s what this soup did. Although it may or may not have the desired result I am certain that it will stay in my repertoire and make an appearance any time I’m feeling ill or if true garlic connoisseurs are expected at our table. Three full heads of garlic go into this soup. Heat the oil and butter in a heavy bottomed soup pot or Dutch oven. Sear the chicken on both sides until it releases from the bottom of the pan. Sprinkle both sides with some salt and pepper as it cooks. Remove to a plate. The egg yolks, added after cooking, add a rich smoothness. While the garlic is sautéing tear the chicken into shreds. Add the flour to the garlic and mash with a potato masher. Allow the flour and garlic to cook for 2 minutes, stirring constantly. 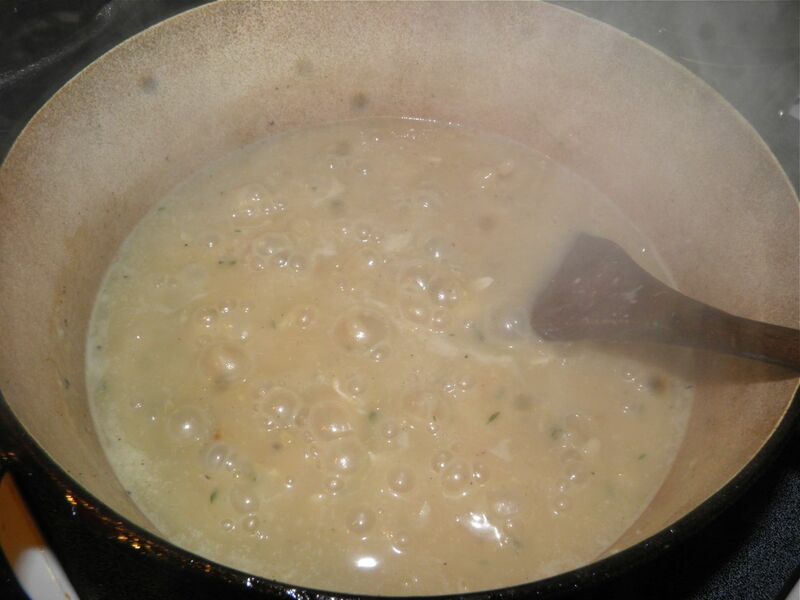 Slowly add the 5 cups of water stirring so lumps do not form. Then add the thyme, salt and pepper and bring to a simmer. 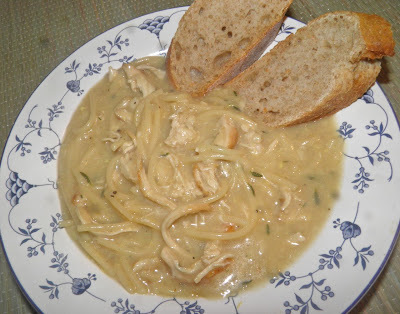 Add the chicken and noodles to the soup and let simmer for 10 minutes. Remove the woody thyme stocks. Most of the thyme leaves should have released. Remove the pot from the heat and stir in the egg yolks. If the soup is too thick, thin with a little more water. Taste for salt and pepper and adjust if desired. Serve with a warm, sliced French baguette. * The sugar is used to slightly mimic the caramelization that takes place when garlic is roasted. If you have an extra hour, roast the 3 heads and use those cloves in the soup. It will add much greater dimensionality.